It has a book-matched mahogany top with vivid grain, the mahogany is 1/2″ thick veneer. 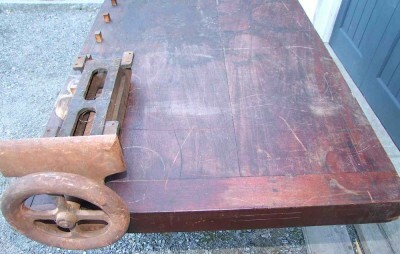 It has a long slot for a sliding dog, but I don’t see any sign of that on the vise, nor do I see that it ever had one. All the other dog holes have their original dogs. The open area under the bench top is odd. 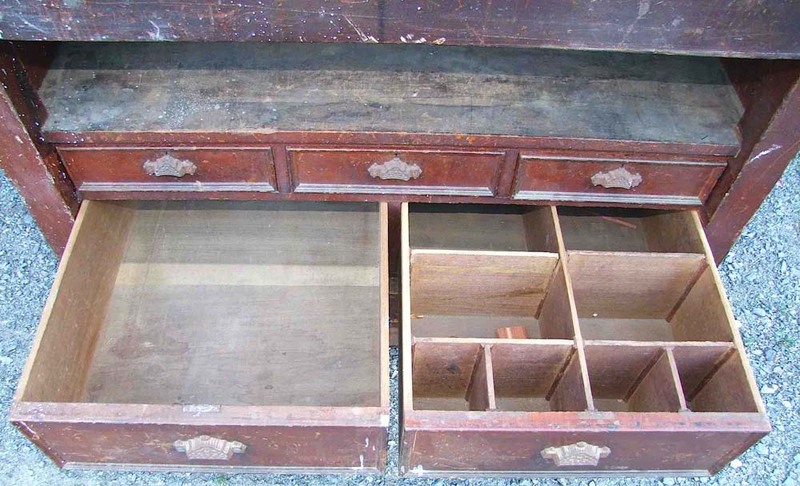 I don’t see that any front/drawer was there. The vises are both original, and off the bench. Each is a different width and with differing length of travel. The fixed jaw is mounted on the top. The metal is japanned, though there is little left. The top needs to be scraped, if you want to make the mahogany pop. It was found near Lawrence, MA, another area for piano making. It’s older than mine. I’d guess it to be ca.1890. And, it’s for sale! If you are interested, contact Patrick directly. His email can be found on this page.